There is nothing more damaging to a company or brand than negative word of mouth. And customers are far more likely to complain when unhappy than to express joy when happy. In fact, the 2015 study revealed that customers are twice as likely to express dissatisfaction than satisfaction. So it’s far easier to diminish a brand than it is to build one. The study revealed that more than half of American households experienced a product/service problem during 2015. And 63% said they received nothing for their trouble. As a result, it is likely that companies are losing more customers than they are gaining, a prescription for declining sales and profits. Ironically, companies’ customer care programs appear to be actually doing the opposite of what they’re supposed to do. 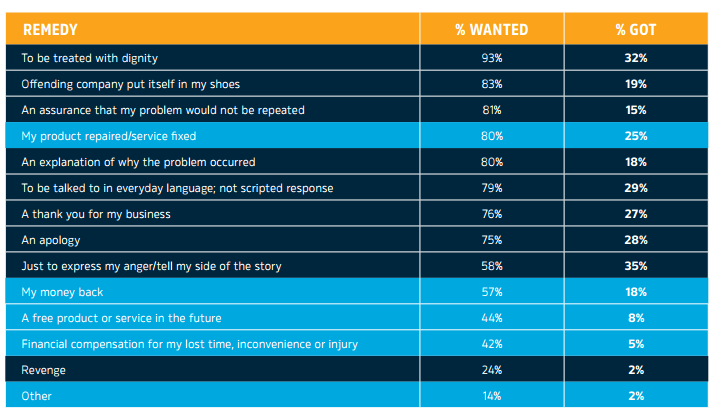 Want to know more about the study and how you can solve your customer care conundrum? To hear more about this topic and others like it, and for more information about Dialog Direct, join us at Customer Response Summit Austin (Sept. 18-20, 2016).